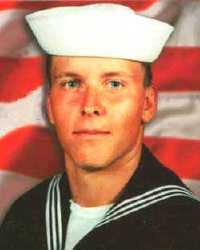 Allen R. Schindler Jr., 22, of Chicago Heights, Ill., was serving as a radioman on the amphibious assault ship "U.S.S. Belleau Wood," in the Navy in Okinawa, Japan. He was brutally murdered on October 27, 1992 by two shipmates in a toilet in a park in Sasebo, one being Airman Apprentice Terry M. Helvey, 21. Helvey beat and stomped Schindler to death because Schindler was gay. Helvey's attack was so vicious that he destroyed every organ in Schindler's body. Schindler was so badly beaten that he could hardly be identified afterward. Schindler's mother, Dorothy Hajdys-Holman, could only identify her son by the remains of a tattoo on his arm. The medical examiner compared Schindler's injuries to those sustained by victims of fatal airplane crashes. Helvey is now serving a life sentence in the military prison at Fort Leavenworth's Disciplinary Barracks, Kansas, although by statute, he is granted a clemency hearing every year. In addition, he will be eligible for parole in the year 2002. Helvey's accomplice, Charles Vins, was allowed to plea bargain and served only a 78-day sentence (!) before receiving a general discharge from the Navy. Not coincidentally, Schindler died shortly after newly-elected President Clinton broke his first promise to the gay community and did not sign an executive order allowing gays to openly serve in the military. What Clinton effectively had done was to create even more of an atmosphere of hatred toward gays in the armed services, and his subsequent "Don't Ask, Don't Tell" policy has led to more anti-gay witch-hunts than ever before. The Navy acted in an unbecoming manner -- not only in that Schindler's commanding officers and NCOs likely could have prevented the crime and failed, but also in that they did not properly inform Schindler's mother of their investigation of the case, and handled the case, quite frankly, like they themselves were delirious with homophobia. By keeping Helvey in prison, the Navy would protect society from a dangerous killer and send a strong message that anti-gay violence will not be tolerated in the armed forces. Schindler's death was something that should have never happened, and it symbolizes most of what has gone awry with the military in general and with the Navy in particular. In terms of military honor, killing a fellow comrade-in-arms is beyond excuse; yet while Helvey was convicted of killing Allen Schindler, he still receives the privilege of clemency hearings. That he, himself, can live is merciful enough. The Naval Clemency and Parole Board has denied clemency Sept. 27, 1996 to Terry Helvey. The denial was confirmed in a letter from Lt. Karen Giaimo of the Naval Council of Personnel Boards. The letter, dated September 24, 1996 states, "On September 18, 1996, the Naval Clemency and Parole Board voted to deny both the request for clemency and the request for advancement of parole eligibility date. The NC&PB's vote for both requests was unanimous." Because of Naval regulations, Helvey's life sentence will be reviewed annually for possible reduction. He will be eligible for parole in 2002. We believe that the possibility of parole should receive no consideration at all. Allen Schindler's mother, Dorothy Hadjys-Holman, is currently collecting petitions to keep Helvey in jail to serve his full life term. Mrs. Hajdys explains the importance of this effort, "The reasons for keeping my son's murderer in prison are simple. Terry Helvey is dangerous. He is likely to do the same thing again, if set free. I do not want any other mother to live through what I have." The grave site of Allen Schindler is located in Steger, Illinois, and each Memorial Day there will be a memorial service held for him. Schindler's murder and his mother's fight for justice were depicted in the Lifetime Television film "Any Mother's Son: The Dorothy Hajdys Story". The Kalbrofsky statement posted as a page of this website allows us to feel Allen Schindler's danger in Sasebo, Japan, during the three days leading up to his death the night of 27-28 October 1992 (Navy Day). In addition to confiding his fear, Allen also told Kalbrofsky how he wished to be remembered: as an openly gay man, who like reptiles; specifically, lizards. In his diary, Allen also confides playing a leading role in organizing what might be called a "gay caucus" aboard the USS Belleau Wood, even offering to prepare rules of organization and procedure for the fledgling group. Twenty-five sailors attended the group's organizational meeting aboard the Belleau Wood. Apparently, a combination support group, political caucus, and self-defense committee; the group's purpose, according to Schindler, was to keep what had happened to him from happening to other sailors. Prophetic - and Terry Helvey has taken this portion of the diary as Allen's Last Will, allowing it to speak, not from the day it was written, but from the moment of Allen's death. He was so badly beaten that he could hardly be identified.